FreshMarine.com - Hagen Exo Terra Sun Glo - Hagen Sun Glo Daylight- Buy Hagen Exo Terra Sun Glo Now and Save! A broad spectrum daylight lamp with a Neodymium sleeve. The spectrum is ideal for plant's photosynthesis and the UVA (ultraviolet A) light contributes to reptiles' physiological well-being. 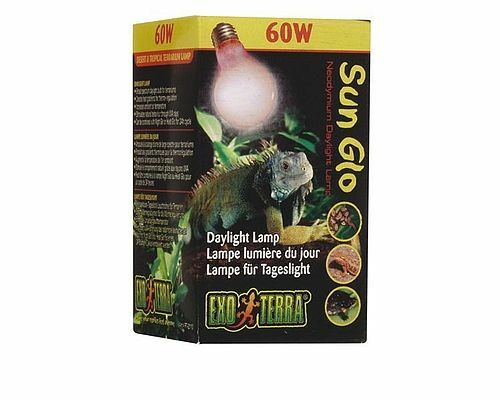 Another important factor is the heat emitted by this bulb to increase the over all ambient temperature in the terrarium. Buy Hagen Exo Terra Sun Glo Neodymium A19, Incandescent Sunglo Daylight Lamp, From Hagen Exoterra at Discount Price!